(Pat)>> Welcome to Engine Power. This '73 split bumper Camaro has been one of the most ambitious projects we have ever taken on. 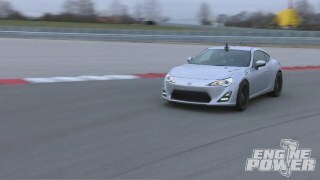 The goal was to create a race car that was equally at home on the drag strip, autocross track, or even the road course. 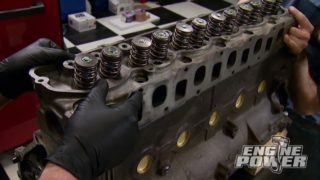 (Mike)>> In a few minutes this second gen is going on a pretty wild shakedown run, but first let us show you how we transformed it from a stock underpowered Camaro into a full-fledged race car. We got a lead on a Camaro for sale in excellent condition, and since we're not paint and body guys it was worth hunting down a solid foundation to start the build. We headed to Louisville, Kentucky, and found just what we needed. It's rare to find a vintage car to exceed our expectations but this split bumper was immaculate. No evidence of rust or body work anywhere. Before the seller could change his mind we loaded it up and hit the road. (Pat)>> From the factory the Camaro had a sub-frame setup with rear leaf springs, but for our purposes we needed something more. Another road trip was in order. This time to Grant, Alabama, home of Street Rod Garage. Co-owner Chris Sutton shared his plan to put a full frame under our rig loaded with the latest in high performance suspension. Chris designed the chassis using measurements from a second gen Camaro he purchased himself. Once the design is laid out each piece of plate steel is cut on a plasma table. No pre-formed tubing is used. While this process is automated the next phase of the build is pure old fashioned craftsmanship. The frame rails are bent and welded by hand. (Mike)>> From Grant we head to Goodlettsville, Tennessee, to get some color and protection. Mister Speed Coatings is a company that lives up to the name. In no time at all we had a thick glossy powder coat finish on the chassis. The color, gun metal. (Pat)>> Back at the shop we began with the suspension. First the control arms followed by the four link. QA One Proma-star double adjustable coil overs featuring independent compression and rebound adjustment let us tune the suspension exactly how we want it. Next a set of Wilwood pro spindles. 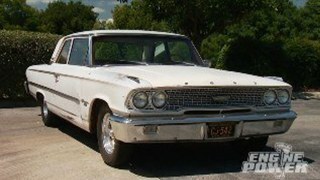 The solid rear axle received a Ford nine inch rear end from Strange, along with Eaton differential and four-ten gear ratio. 13 inch Wilwood brakes on all four corners provide massive stopping power. 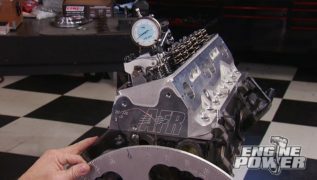 (Mike)>> The heart of this build is World Products' Motown LS engine block. A hybrid engine. It accepts small block Chevy parts from the deck down and LS induction up top. 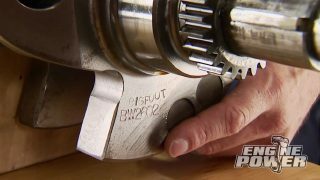 An Eagle crankshaft gives us a four inch stroke. For pistons we went with Mahle's Power Pack kit. They are made from 40-32 alloy for strength and durability. The pistons were mated to a set of Eagle's forged 43-40 H-beam rods using ARP fasteners. A shot of Dupli-Color Cummins beige gave the engine block some retro '70's style. A custom ground Erson hydraulic roller cam shaft was spec'd out with big duration and lift, and was complimented by their tie bar lifters. The Jesel belt drive assured us more strength, precision timing, and easy adjustability. The pickup, gasket, and Canton oil pan were all sourced from Summit Racing. (Pat)>> We installed a set of Trick Flow Gen-X 260 LS seven cylinder heads. They are free flowing and designed for big bore applications. Topping off the engine was an Edelbrock Super Victor LS seven intake manifold. It's built to handle over 800 naturally aspirated horsepower. 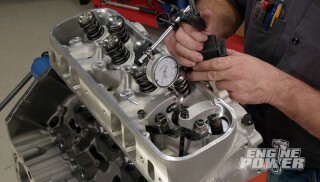 Trent Performance push rods and one point eight ratio Jesel rockers completed the valvetrain. 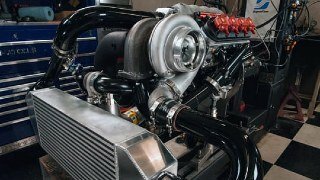 With a Holley XP 10-50 Ultra Dominator delivering the fuel the engine produced 677 horsepower and 561 pound feet of torque. (Mike)>> We made a minor body mod to fit bigger race tires out back. Detroit Speed mini tubs give us the extra room while keeping the stock appearance. XOR's Jeremy Weckman helped out with the body work. (Pat)>> After a coat of seam sealant and paint they almost look factory. (Mike)>> The Ride Tech tiger cage offers the protection needed in a race car. In addition it increases the structural rigidity of the vehicle, allowing the suspension to react more predictably to driver input. Using a set of pre-bent tubing and clamps, the kit was installed in about six hours. (Pat)>> Fitting a three inch exhaust in a '73 Camaro that's already riding on a full frame chassis, that's a challenge. If anyone was up to the task it was Magnaflow's exhaust wizard Richard Waitus. Twin mufflers at the back give the exhaust a subtle yet modern styling cue. (Mike)>> A three point two inch diameter carbon fiber driveshaft from QA One kept rotating mass low and strength high. It's rated for over 2,000 horsepower. More carbon fiber arrived from Anvil Auto. They sent us a full complement of gorgeous yet understated body pieces. We like the look of the matte finish on most of the panels, but couldn't resist going for the glossy finish on the cowl hood. Hoosier Sport Car DOT radials provide superior traction on the hot dry surface of the race track. We chose the R-compound rubber designed for road racing. (Pat)>> It took countless hours, a ton of work, and plenty of high performance parts, but this Triple Threat Camaro was totally worth it. (Mike)>> Now it's time to pound the pavement. (Narrator)>> Up next the Triple Threat Camaro gets a little loud and loose on its maiden voyage. (Pat)>> Oh this is my hot shot driver right here. (Marc)>> Well they were gonna hire a professional driver but Mario Andretti was already booked. (Pat)>> Well that makes sense then. (Marc)>> Joey Logano was polishing his trophy, and Tanner Faust, he was closing on his winery today. So he couldn't make it. (Pat)>> I can believe that. That all being said what did you think? (Marc)>> The car was amazing. I mean this thing has way more power than you need, which I love. (Marc)>> It's a burnout machine, love that about it, and I've really got to give you credit for leaving the vinyl top and leaving the paint the way it was. Adding the new accents with the carbon fiber, great look, great feel. The car stops on a dime. I'd like to see what this thing would do out on the drag strip. (Pat)>> It would be interesting, yes. It's got plenty of power. Now it does have a four-ten gear in it. So it's a little spicy for like open road course, but for this type of thing I think it'd be pretty fun to see what it would do. (Marc)>> I'm really amazed. I'm glad that you guys built a car to this level. Amazing, amazing job. (Pat)>> Thank you very much. Well I'm just trying to keep up with you guys down there. So you guys got it going on too. I think it's time to get out of here. (Marc)>> Yeah let's go. How about some doughnuts for lunch? (Pat)>> I like the sound of that. (Narrator)>> Up next, no matter how you're involved in auto racing you need to be at PRI. (Pat)>> It's one of my favorite times of the year and I'm in one of my favorite places. 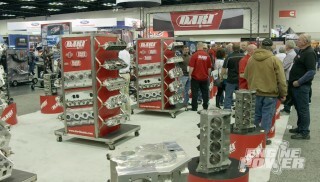 I'm at the Performance Racing Industry, or PRI show here in Indianapolis, Indiana. For engine builders and racers alike this is the place to come to see new technology and parts that make everything they have go faster. ♪ ♪ Since 1986 PRI has represented the automotive racing industry. Keeping an eye on the latest developments in technology and business. 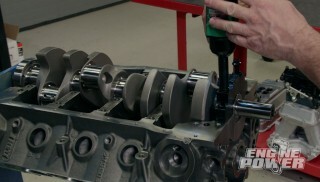 PRI connects aftermarket manufacturers with race teams that use their products. Over 1,100 companies are here filling this massive 750,000 square foot space with products and exhibits, and sharing their years of experience. For the next three days if you're into auto racing or anything high performance you'll want to be here. 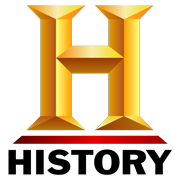 The automotive aftermarket we enjoy today was founded by a group of pioneers who wanted more power and better performance than early factory vehicles could offer. No name stands taller than Victor Edelbrock, and for 80 years Edelbrock has supplied racers with go fast parts designed and built in the US. 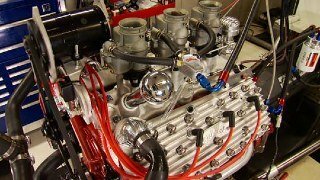 One of the biggest names in Pro Mod drag racing has had a relationship with Edelbrock for years, and his crate engines are available to sportsman racers everywhere. I'm with a guy who literally needs no introduction, Pat Musi of Pat Musi Engines. Now you know we've both chewed a lot of the same dirt in the engine building stuff. Tell me what's new and exciting with you and all your engine stuff. (Pat M.)>> Well we're gonna continue with our Pro Mod deal. We feel like we're at the top of our game. We've been for the last five, six years now. (Pat)>> Musi opened his shop fresh out of high school in 1970. He has decades of experience racing nitrous engines. So when he offers advice we listen carefully. (Pat M.)>> A lot of this nitrous stuff is tune up related. You could have the best heads, and the best manifold, and the trick of the week, but the whole package has to work. Camshaft, tune up, and that's what we can bring to them. (Pat)>> Richard Maskin founded Dart in Oak Park, Michigan, in 1981. From humble beginnings in a two car garage Dart grew into a leading manufacturer of cylinder heads, engine blocks, and intake manifolds. Like many gearheads, his career started with a love of racing. (Richard)>> I was racing Pro Stock and I ran out of money, and I had to find a way to put food on the kitchen table, and here we are. (Pat)>> And whether you find yourself behind the wheel of a race car or elbows deep in an engine build Maskin says the key to success is this. (Richard)>> Go to work for somebody who knows what they're doing and learn from them. That's how I did. 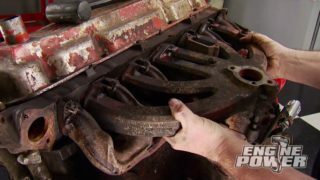 My grandfather owned a Pontiac dealer, and I would watch the mechanics day in and day out until I could do what they did. (Pat)>> John Kaase brought some cool stuff to his booth, including this Mercury Marine 550 cubic inch twin turbocharged V-eight. It makes 2,000 horsepower, and two of these engines power the Miss Geico race team to a victory in class one boat racing. He may be a world class engine builder but Kaase is a lifelong student, and the PRI show is his classroom. (John)>> Never do I leave where I haven't learned a few things. And it's like, I'm gonna do that on an engine when I get home. Hey I like that part. That little widget. Why didn't I think of that? (Ken)>> You can learn so much from this because you interact with all the people in the industry. If you've got a question you might be talking to the guy that is the main guy, main principal in that particular area. Whether it be heads, cam, block, whatever. It's a must do thing if you're even the least bit interested in being in the industry. (Greg)>> This is our time of the year where you've got to actually learn things and do things different for the race season. This is why everybody comes here. Everybody involved with the race industry comes here. So you put a lot of names with faces that you don't get to see during the year. You see a lot of products that vendors have been talking about all year and they debut them here. So it's just the place to be. (Narrator)>> Up next we bring words of wisdom from racing's veterans, and show you what the next generation of gearheads is doing. 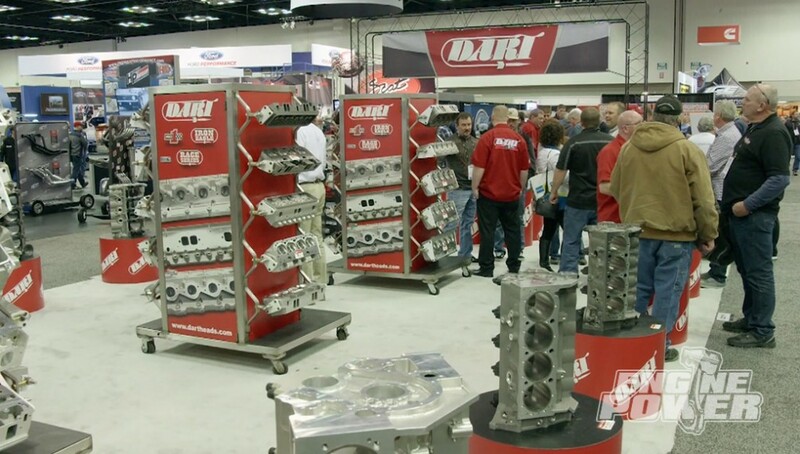 (Pat)>> We're back on Engine Power at the PRI show in Indianapolis. This is the main event for everyone in the racing industry, and we caught up with a legendary engine builder. What advice would you give an engine guy or a race car guy about getting started, and what advice would you give them for a key for success? (David)>> Well I think coming to the PRI show is a good idea especially if they're just starting up and they've never been to anything like this. It can help them maybe make some contacts because the important part of a small business like that. Our little cult business, or whatever you want to call it, niche, is getting some relationships. You're not gonna make those unless you meet people, and tell them who you are and what you're planning on doing. (Pat)>> In today's internet connected world it's crucial to have a strong online presence but nothing beats the real interaction of people and the parts they create. (Keith)>> We do the internet and social media but they get hands on here. They get to feel it, ask questions, and look at the part and evaluate it themselves in person. (Pat)>> Speaking of hands on experience these young people from Hot Rodders of Tomorrow are getting plenty of it. At an age where most kids are playing with building blocks they are focused on engine blocks. Today they're building a five horsepower Briggs and Stratton, and the fastest time so far is an impressive 17 minutes. More important than working fast is working right, but the biggest goal for Hot Rodders of Tomorrow is giving young people a stronger understanding of math and science, as well as creating a new generation of gearheads to keep up the tradition. For those who race engines, the main hall full of shiny high tech components draws them in. For those who build engines it's all about machinery row. Here they find a plethora of fabrication and machining equipment. Plus a group of manufacturers ready to help them setup their shops for success. What does PRI mean as far as from a customer standpoint? From a manufacturer standpoint? (Tim)>> You know I think networking is great. Other vendor suppliers that are here that we get to network and talk about maybe what the compatibility with their components with what we're doing in the machinery side. It's really important to keep up with what's going on in the industry. People that are not attending PRI are just gonna get further and further behind every year. We've been with them for 30 years. So it's really nice to be here every year doing this and keeping track of what's going on in the industry. (Keith)>> You're never in front of this many people in our industry ever the rest of the year. People are more low key, meaning they're not on a schedule to qualify, race time. So you can talk to people. You can talk to people in meetings after, during. So PRI is invaluable in our form of business. (Mike)>> Today we have a special guest to talk about air and fuel delivery on everything from street machines to the fastest naturally aspirated race cars that he's extremely familiar with. 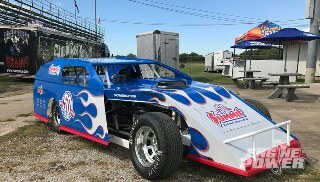 It's Jason Line from the extremely successful Summit Racing sponsored team of KB Racing. 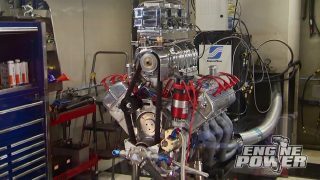 (Pat)>> You may already know it but I worked with Jason at KB Racing building NHRA Pro Stock engines, and we had a lot of fun doing testing and development. And some of that technology will actually trickle down into street machines and high performance vehicles that we all like to drive. Jason I brought you something that's near and dear to your heart here. (Jason)>> Yeah one of my favorite relics of all time, the Quadrajet. You know carburetors have come a long ways. You can now buy street carburetors with c-n-c billet metering blocks all the way up to full out race dominator. So they've come a long ways for sure, and it's definitely better, and that stuff does transfer down to all the parts you buy from Summit. (Pat)>> Is it from the machining process, is it from materials? What's it from? (Jason)>> It's all those things. Racers are pretty crafty folks and they come up with a lot of really cool things, and it all transfers. (Mike)>> Jason 10 years ago you would buy a boxed carburetor and have to send it out to get it to perform right. What's changed over those years? (Jason)>> Well certainly the folks that manufacture carburetors have gotten much better at getting a calibration that's correct right out of the box you can actually bolt on now, and I've done it myself, and have them run good right out of the box. (Pat)>> Let's talk about intake manifolds. Now days it's easier to make power with bolt together stuff. (Jason)>> It's way easier. Years ago to make a 1,000 horsepower engine, that was quite a task. Now you can buy every single part from Summit. It bolts together and make 1,000 horse. 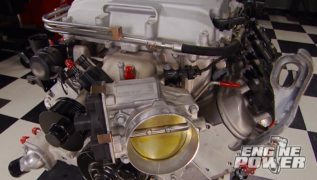 The manifolds and cylinder heads, every single part of the engine has gotten so much better with new technology, and it's all race driven technology. So it's also much harder to improve on them. (Pat)>> And your job is to improve on things. From the street standpoint all the technology that trickles down, that's one thing because racing is so fast moving and the technology moves so fast. You still have a few secrets that you want to keep. (Jason)>> It does move faster because obviously we're not under the constraints drivability, or emissions, or any of that kind of stuff. Yeah we like to keep as many secrets as we possibly can. It's harder to do in today's world, but we'd like to keep them for a certain amount of time before we're willing to pass that information on. (Mike)>> Now Jason how much time actually goes into your testing and development compared to when you're at the track racing? (Jason)>> Well obviously the development starts at the shop, and our time is certainly best served at the shop. You have to prove it out there first and see that it's viable, and it's gonna make power, and then go to the race track and try to do the same thing. Make sure that it's making the same power that you were capable of making there at the dyno. 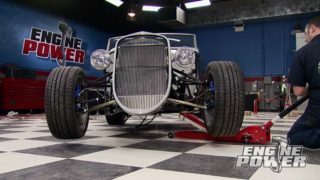 (Mike)>> Now Jason do you guys do any testing on the chassis dyno and the engine dyno, or how does it work? 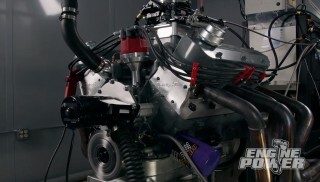 (Jason)>> Well lots on the engine dyno of course, but we use the asphalt dyno as well. (Mike)>> Out at the track? (Jason)>> Out at the track. (Pat)>> Well thank you for coming in. We always enjoy hearing your insight.